I have a confession to make. Up until recently, I have been operating in my kitchen without any sort of legitimate food processing device. I know, I know, a truly unimaginable feat for someone who possesses my culinary talent, though what can I say—come talk to me when you’ve paid off all of your student loans. For the past couple of years I’ve relied on my trusty Magic Bullet, a solid little piece of machinery, (and one which boasts, undeniably, the most captivating infomercial on current circulation. What other infomercial features a hang-over-battling, charming man named Berman, a cigarette wielding grandma named Hazel, and duo of specious and potentially fornicating hosts?) though one which lacks size and durability. Thus, when my bullet died a couple of months ago, I have been forced to live in food processing obscurity. Fortunately, this all changed when my lovely girlfriend bestowed upon me the mother of all kitchen appliances—the Cuisinart Prep 7® 7-Cup Food Processor—Boom! I was straight giddy when I took the beast of its box. Having not been food shopping in almost two weeks, my pantry was running pretty thin, but as excited as I was, I needed to decimate something fast. Last week I stumbled upon a recipe for homemade hot sauce that I was linked to from one of my favorite blogs, SeriousEats. The link took me to The Paupered Chef an unfamiliar site for me, though one which was definitely intriguing. The recipe called for items which I had actually had, so considering my poorly stocked cupboard, homemade hot sauce seemed like a no brainer. I stayed pretty true to the recipe except I substituted pre-ground spices for whole one’s, and instead of dried Chile’s de Arbol, I used some nondescript Thai chilies I bought at my local Asian market. For my first ever homemade hot sauce it wasn’t bad, though I think there is definitely room for improvement. The first thing that caught me was the intensely hot aroma. This stuff was spicy. When I popped the lid off the Cusinart I couldn’t help but cough—waaaay hotter than my beloved Shiracha. Upon tasting the sauce my palate was inundated with the taste of sesame, and a little too much by my standard. Also, my sauce was a bit runnier than the one illustrated in the original recipe. Like I said, the sauce wasn’t bad, though as an aspiring hot sauce enthusiast, I think I can do a little better. Next time I’m going to take it easy on the sesame, and maybe add some mustard seed, more salt, and a whole lot more garlic. I tired Sky Burgers, again, and it was good, again (also, the restaurant is called Sky Burgers, not Sky Burger as I previously mentioned). This time around I went for the Papa Sky Burger—8 oz. of beefy goodness with cheddar, lettuce, tomatoes, sautéed onions, and a side of fries. I was a little worried when the burger arrived considering my stomach was in a bit of a frail state following a night of celebrating my birthday, but I managed to get the Papa Burger down with no problem, for as you all know, grease cures hangovers. Amidst eating I blacked out in a rage of hunger, though when I came to I had about half a burger left and was being subjected to a truly horrible cover of The Doors classic “Light My Fire” playing in the background. Realizing that it was my duty to provide an update, I slowed myself down and analyzed the situation. Fresh tasting beef, good veggies, good burger, that’s what Sky Burgers provides. They even have a wide array of goofy sides that you can order with your burger, like spicy chipotle mango relish, which my girlfriend tried and wasn’t half bad. I can say, conclusively, that the Sky Burger Papa Burger is way better than what Nectar’s, KKD, and Vermont Pub and Brewery has to offer. The jury is still out on Rira. My only knock on Sky Burgers is that the establishment itself is a little cheesy (the kitchen door says “Burger Lab” on it, for example), but that fact can be overlooked for alas, it is merely a burger joint. Sky Burger has my recommendation. Go check it out. If there is one thing that the city of Burlington seriously lacks it is a good and reliable burger. Of course, you can find a plethora of burgers on the menu of most restaurants and eateries in town, though what I’ve come to find is that none of these establishments are able to consistently step up to the plate and construct a burger worth remembering. I have recently determined it as my task at hand to find this mystical praiseworthy burger, my holy grail. Along the way I will not hesitate to convey the wretchedness of a bad burger, and without further adieu, my take on the Burlington burger scene. First of all, when talking burgers, fast food is automatically excluded. It just doesn’t count. That also goes for places like Al’s French Fries, one of my favorite greasy spoons in the area, but quite frankly, they are just a notch above fast food. What I want in a burger is very simple, yet for some reason very hard to attain: quality beef, fresh vegetables (lettuce, tomato, and onion), a hearty bun, and good cheese. Additional fixings are certainly nice to have as an option, but really, the only thing that matters in a burger is the beef, those three simple vegetables, and the bun—all else pales in comparison. Perhaps the biggest travesty of them all is The Nectar’s burger. Nectar’s is one of Burlington’s most well-known bars, and I suppose you could also qualify it as a “grill”. Nectar’s is probably most famous for their music scene, attracting both big and small acts to play on their stage, even gaining some national recognition for being the launching pad of the popular band Phish, as it was at Nectar’s where Phish first began playing shows back in the 80’s. When I first moved to Burlington, Nectar’s was of the most reliable places to get good bar food in town, though about two years ago they renovated their entire establishment, removing one of their two kitchens and drastically downsizing the other. Not only did they destroy their kitchens, but at the same time their whole menu changed as well, and their ingredients suffered. The Nectar’s burger was once a Burlington institution that always provided the same satisfaction whether it be at 12:00 PM or 2:00 AM. Now when ordering the Nectar’s burger you are too often served an overcooked, underwhelming, small burger accompanied by soft tomatoes, discolored lettuce, all on an oversized English Muffin—an utter abomination. It’s just disappointing to know what the Nectar’s burger once tasted like because the new and improved denigrated burger is a waste of $8.00. At least they still have gravy fries. Kountry Kart Deli is another place where the burger is a common option. Personally, I don’t think KKD makes anything that is worthwhile (their only saving grace is that they stay open something like 22.5 hours a day) so these words should come by no great surprise, but nonetheless, people seem to like their burgers. Similar to the Nectar’s burger, KKD lacks virtually every component that makes a good burger, starting with the beef. For whatever reason, I have tried the KKD burger many times and undoubtedly, I am left continually unsatisfied. KKD makes “The Vermonter”, a 1/2 lb. patty, and “The Flatlander”, a 1/4 lb. patty, though whichever sandwich you choose, expect to be served something drier than a popcorn fart. Without about three packets of ketchup and two of mayo the thing is hard to get down. The burger itself is not their only problem though. KKD uses, on all of their sandwiches, perhaps the worst bread known to man. Frankly, they should be embarrassed for all of their bread products are disgraceful—nothing better than oversized hot dog rolls. Moreover, it doesn’t help that their accompanying vegetables make Nectars’ seem like a salad at the Four Seasons; mealy tomatoes, ugly lettuce, puny onions. Honestly, it’s making me angry just thinking about it. Both KKD burgers are utter failures in the burger world. Rira, the cities local Irish pub, is perhaps a glimmer of light in the burger hell to which Burlingtonians dwell. The Rira burger is usually heights above both Nectar’s and KKD, but it too has its shortcomings. All of my stated “good burger requirements” are met at Rira, so for that they should be proud, and they even also feature a long list of unique accoutrements. Maybe even the best part about Rira is that Wednesday is half-priced burger day. All of these positives, though, simply don’t outweigh the fact that sometimes the Rira burger is not up to snuff. I have gotten great burgers from Rira, and I have gotten less-than-great burgers from Rira. It’s like a crapshoot, and for that reason only I can’t sing their praises. If they could find a way to get their kitchen staff consistent, then maybe this article never gets written. When they’re on, they’re on, but too often the Rira burger is nothing special—much better, in any case, than the two aforementioned holes in the wall. Next we have the Vermont Pub & Brewery, also known as the Brew Pub. I haven’t had a Brew Pub burger in about a year and the fact that nothing in particular comes to mind when thinking about it sums up my opinion of it pretty succinctly. If it wasn’t good enough for me to remember anything specific, and it wasn’t bad enough for me to actively hate it, than I can conclude that it was just alright, and thus not worth ordering. For that matter, I can’t recall anything too great that I’ve had at the Brew Pub, and I don’t really see anything special about their beers either. If I’m in the mood for a good, locally brewed, small establishment beer I’m most certainly walking a block down the street to American Flatbread…I bet they would make an excellent burger. Really, this list could go on and on, but it would just reiterate the same few points: bad, overcooked beef, weak vegetables, unsatisfactory roll. If you name me anywhere in Burlington that makes a burger I’ll find you an easy shortfall, it’s just fact. While Vermont procedures some damn good cheddar to go on the burger, Burlington seems yet to have figured out the burger part, in actuality, the most important part. All of this leaves me to, perhaps, the coming of the burger messiah; a brand spanking new burger joint: Sky Burger. Sky Burger opened up a couple of weeks ago on the corner of lower Church Street in place of the defunct Tilley’s Café. I was walking down the street last week when I spotted it out of the corner of my eye; fancy silver lettering, nice paint job, Sky Burger? Armed with curiosity I crossed the street and walked into the establishment only to find a pretty solid set up. Sky Burger is a fairly large place with plenty of room, nice TV’s, and a really good looking bar. I’m not really sure who is going to choose to spend their evenings drinking at Sky Burger, but for whoever it is, it looks like they will be very comfortable. After I entered Sky Burger I asked to see a menu just to check things out (I had just eaten and wasn’t terribly hungry), but considering I had gone out of my way to see what was up, and given my taste for burgers, I decided to order a 4 oz. “Baby Sky Burger” just as a snack. I waited for about 15 minutes, which was a nice sign indicating that they make everything fresh (since the place was empty), left Sky Burger—burger in hand—eating as I walked down the street. Now, granted, this was only the baby burger, but I have to say, it was good. My Baby burger had the greasy, beefy, goodness that a proper burger should exude, good bun, and fresh veggies! Is this the remedy I was looking for? Can Sky Burger satisfy my undying thirst for ground beef and cheese? The answer to these questions remains to be seen, but I sure as hell intend to find out soon by picking up the “Papa Burger” to see what Sky Burger is really all about. I’m feeling optimistic. More to come, stay tuned. Ah yes. On Saturday night I became the proud owner of one beautiful 7 oz. container of D’Artagnan rendered duck fat. There I was, minding my own business, walking through the halls of my local food market (City Market to be exact) when I spotted something of pure unadulterated splendor: packaged duck fat. Never before had I seen duck fat for sale in the dairy isle, and the second I picked up the container I thought about popping the top and eating it straight, right then and there. 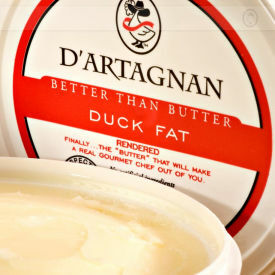 Quite simply, the label reads “D’Artagnan Rendered Duck Fat: Better than Butter”. Sold! Duck fat. The fat of champions. The most gourmet of gourmet cooking oils. There are so many things that I love which are made with duck fat: duck confit (currently my favorite entrée), frites (French fries) fried in duck fat (see my post about Montreal), potatoes roasted in duck fat, sautéed asparagus in duck fat, the list could go on forever. Basically, if you add “in duck fat” to the end of any sentence, the chances are I will find it 300 times more appetizing—inanimate objects not excluded. Maybe even the greatest fact about duck fat is not that it makes virtually anything taste better, though additionally it is one of the healthiest cooking oils to work with. As referenced below, duck fat provides all the taste of butter (only BETTER!) with the nutritional value of olive oil—astounding! Last night my girlfriend went for a night on the town, and decided to dine at a fairly unknown, nondescript Italian restaurant in Burlington, L’Amante. L’Amante is located on College Street, directly across from Burlington’s newest Vietnamese Restaurant Saigon Bistro (which you all should check out as well; very tasty Duck stew). I’ve walked past L’Amante countless times and have always wondered where the hell this place came from? Every time I get involved in a conversation regarding Italian restaurants in Burlington, I have never once heard L’Amante mentioned. Why does this place not gain any recognition? It’s in a pretty solid location, the ambiance seems very nice, and let’s be honest, Burlington isn’t exactly overwhelmed with favorable Italian restaurants, so why is L’Amante not in the mix? My goal was to answer this question. I first found out about L’Amante a couple of years back but had never had inkling to step inside its doors until one fateful evening. As I was walking back to my house on a brisk December night, I spotted a former economic professor of mine looking fantastically drunk, waltzing around like Kanye at the MTV Video Music Awards. He was singing for shits sake, in clear sight from the window. I have a great deal of respect for this professor, and once I learned that he is a patron at this potentially fine establishment, I knew that I needed to give it a try. I made a 6:30 reservation, which at the time seemed a little unnecessary, but in retrospect was a great call (it got very busy as the night went on). We arrived a little early and were ushered to a nice table in the restaurants main dinning room. L’Amante has a very nice ambiance, notwithstanding that it was fairly dark which made it a little hard to read anything. After our server greeted us with our menus we ordered a bottle of Chianti and continued exploring the dinner menu. We were both extremely hungry so deliberating about what to order was a bit of a task. Our server returned with a basket of bread accompanied by chicken liver pate (nice!) and butter. I immediately went to town on the chopped liver and continued to neglect the menu until noticing a prosciutto appetizer and promptly placed an order for it. Despite the fact that I was totally psyched on the liver, what kind of Italian restaurant doesn’t serve olive oil with their bread? Answer that however you will, but L’Amante does not, loosing immediate points with me. Before I knew it, a massive plate of prosciutto was planted in front of us—good lord. I’m all about prosciutto, but I felt like we had just slain a whole pig. As we were enjoying the deliciously salted slivers of meat, we decided on two entrees to share and ordered them; Potato gnocchi with slow roasted pork, tart cherries, rosemary, and balsamic, and Orange marinated, boneless trout. There’s just something about gnocchi and slow roasted pork that captivates me. Last time we ate at another one of Burlington’s Italian establishments –Trattoria Delia– I ordered practically the same entrée. Amidst a good conversation about the philosophy of ethics, that’s right, our entrees arrived and we were eager to dive into them. I started on the trout, which simply put, was excellent. Trout is one of my favorite fishes, and this dish was cooked to perfection; a large filet of extremely light, appropriately flakey, and properly marinated fish. Its flavor was not overwhelmingly orangey, nor was it too fishy. It was clear that the catch was very fresh, exactly the way it should be, and exactly the way I expected it to be—great dish. After devouring about half of the trout we decided to exchange meals. I can’t say I was too happy to give up the fish, but the gnocchi was certainly calling me name. My first impression of the gnocchi was that the pasta itself was a little too mealy. It wasn’t bad by any standard, though compared to what I have had in the past (i.e. Trattoria) it could have been fluffier. Next the slow roasted pork was rather though, not at all what I would expect from “slow roasted pork”. Lastly, the tart cherry sauce was too tart. At first it was nothing to note, but nearing the end of the dish I felt like I was halfway done with a cherry pie—way too sweet, way to sour. I could barely finish the gnocchi, and had I not greatly enjoyed the trout, and stuffed myself with prosciutto, I probably would have been far more irritated. We finished our wine, continued our conversation, which has now moved onto political philosophy and postmodern thought (I mean we were in semi-formal attire, would you expect anything less? ), and paid the bill. The meal was good, not great, but good—solid for Burlington. Three quarters of it was very enjoyable, but the gnocchi could simply not be ignored. The pasta was poorly made, the pork was poorly cooked, and the sauce was entirely too bitter. I’d give the dish a C+ at best, whereas Trattoria gets an easy A (not to mention their version of the dish is served with “braised wild bore”—far more exotic [sic] badass, and thus far more desirable). I was glad we chose to dine at L’Amante. It was reasonably priced, the menu (for the most part) was very good, it had a very nice atmosphere, and the staff was pleasant. Maybe I was just dealt a bad hand with the gnocchi, but next time we go for Italian in Burlington, Trattoria Delia, not L’Amante, will be the destination. Being the uninspired morning person that I am, I oftentimes neglect to make myself lunch for the day and am forced to show up at work empty-handed. Today, unfortunately, was one of those days. “Office food” as it is sometimes referred to, is a typically a depressing notion. My office, located in Waterbury, VT, is not exactly a hub of culinary innovation, so suffice it to say that I do not usually get excited for the prospect of having to purchase and eat office food (except, that is, on Mexican Fridays!). So today when one of my colleagues suggested going to Subway for lunch, I did all that I could to prevent myself from punching a hole through my computer screen as I agreed to his proposition. I swallowed my pride and thought, what the hell; I’m entitled to a $5 Meatball Marinara foot-long every now and again. We drove to Subway, and after searching for a parking spot for nearly 10 minutes, I entered the establishment’s fog-covered doors seething. After glaring at the menu for a brief minute, I noticed something of a surprise—the Subway Hot Pastrami?! In shear disbelief, I asked the woman behind the counter to show me a cut of the meat. 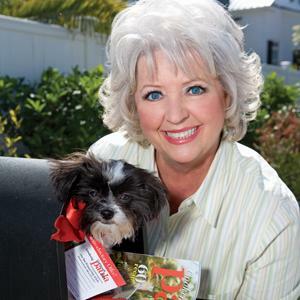 She opened up a container and pulled out a little plate filled with what looked like legitimate pastrami. I couldn’t believe it. It even had proportionate fat distribution that packaged pastrami has seldom been able to achieve. It looked real. 1) Rye Bread – no dice. 2) Spicy Mustard – they actually have it! 3) Cole slaw – don’t think so. 4) Sliced Dill pickle – surely you jest. Ultimately, I decided on “Hearty Italian” bread, Swiss cheese, and had them toast the sandwich in an attempt to make it seem more authentic, hopefully. What I was presented with was not much to write home about. The sandwich was oozing with fatty juices, which was just plain unappealing. Additionally, not having rye bread is a detriment to any pastrami sandwich, and the Hearty Italian did not do much to impress my palate. The mustard was weak, and the Swiss wasn’t plentiful enough, but most importantly, the meat was generally inadequate. The pastrami was way too greasy, a tad chewy, and just did not contain nearly enough flavor—though, having said all that, I have certainly tasted worse. A Day of Brisket—Bring Your Kippah’s! Lately I have been really into slow cooking things. A couple of weeks ago I roasted a pork shoulder for about 6 hours and shredded it into a nice pulled pork meal. Simply delicious. This past weekend, in an effort to change things up a little bit, I decided to slow cook a piece of beef. When slow cooking beef, there are many routes to go, and a plethora of cuts to choose from. Having been raised on Jewish cuisine (see my posts on pastrami), there seemed to be only one logical conclusion to my slow cooking desires: Brisket. Just the thought of moist, tender, meaty brisket made my mouth water long before I had even purchased the massive hunk of meat. Going to the mountain on Saturday for a beautiful day of snowboarding, I decided to pre-order my brisket while we were in the lodge for lunch. The guy sitting next to me at the bar seemed to find it rather odd that I was asking the person on the other line to “make sure it’s a nice cut, and DON’T even think about trimming the fat.” Clearly, I thought, this guy knows nothing about meat, judging especially from his hideous one piece ski suit and glass of chardonnay. We finished the day of skiing and on the way home stopped by the market to pick up my meat. I was a little surprised to find that the 5 lb. brisket went for about $20.00, I suppose only because my 4 lb. pork shoulder was something like $4.50. The young girl at the checkout counter looked at me with a gaze of horror as she rung me up. I think she was a vegetarian. What the hell is with these Vermonters and their seemingly intense fear of beef? Man up, enjoy life, clog an artery! The recipe I used is pretty much an exact copy of Ms. Paula Deen’s, and even though it was tagged as “Texas Style”, and I was going for more of a “Palm Beach”, “New York”, or “Israel Style”, Paula has never steered me wrong before. I got home, plopped the brisket in the fridge to be dealt with in the morning and went about my night. The next morning I began preparing the brisket at about 11:00 AM, combining the spices in a bowl to make a nice rub. [Note regarding the rub, which is annotated below: It is very important to use kosher salt in this recipe. Using conventional table salt (which should never be used anyway) will result in the rub, and impending flavor of the meat, being entirely too salty. The explanation for this is that kosher salt crystals are far bigger than the conventional table crap. This essentially means that 1 tablespoon of table salt is equivalent to about 4 tablespoons of kosher salt. Again, stay away from Morton’s (unless that is you’re using it for tequila shots, which is honestly the only reason I keep it in the house).] And I digress. After coating the meat in the rub, I placed it in a roasting dish, covered it with plastic wrap and let it sit in the fridge for about an hour. [Another note: allowing the brisket to marinate in the rub is not nearly as important as it is for something like pork. A pork shoulder requires maximum marinating time (overnight) because when cooked, the meat itself produces much less of its own juice than does beef. Also, unlike roasting pork, the brisket will essentially be braised in the beef stock/Worcestershire mixture, allowing for sufficient flavor infusion. After allowing the oven to pre-heat, I diced up my onion (I actually used shallots which is highly recommended, and are in fact more flavorful than onions) and covered the brisket with the tiny bits. The cooking aspect is relatively uninteresting other than the fact that as I mentioned, the brisket was pretty much being braised, which was a surprise to me. The liquid surrounding the beef was practically boiling, and the aroma coming from the oven was cotdamn scrumptious. My roommates were actually angry with me for tantalizing their taste buds. Lo and behold, about 4 hours later the brisket was finished roasting, and looked awesome. I let it rest for about 15 minutes and then went into it with my Cutco. carving set, which for the record, could take your hand off. The meat truly exhibited that fall off the bone consistency (despite the fact that there was no bone), and compared to Thanksgiving turkey carving (which was the last time I donned a carving knife and fork), the brisket was a breeze. We ate with some sautéed green beans and purple potatoes—check these out (http://www.recipetips.com/glossary-term/t–35073/purple-potato.asp). Overall, the meal was excellent. I gave myself a nice pat on the back for a job well done. If you like brisket or slow cooked meat in general, I highly suggest trying out this recipe. It is super easy, and unless you a) cannot read, b) use TABLE salt, or c) enjoy desiccated meat, then I guarantee that you will love it. 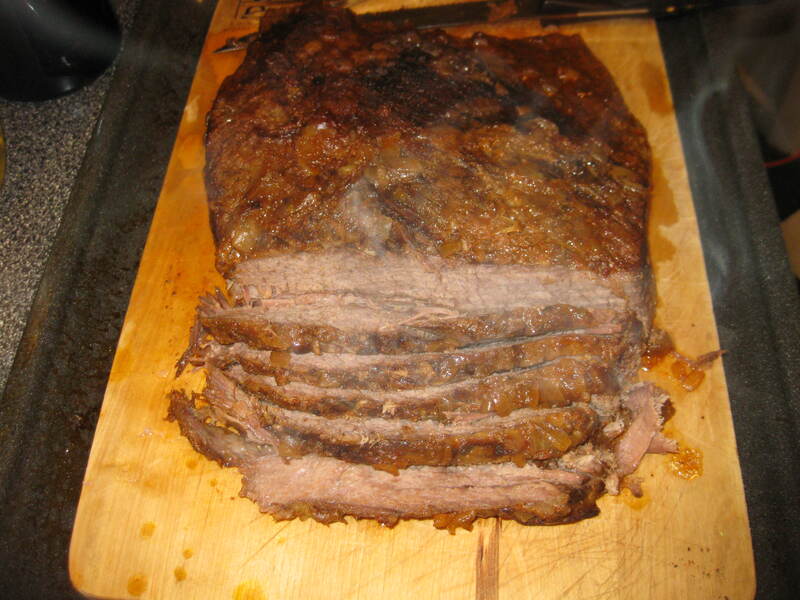 Also, regarding the Texas v. Jewish style brisket—I’m convinced there is no difference. This brisket tasted exactly like the kind I’ve been eating at Passover Seder’s my entire life. A true Mitzvah! Make a dry rub by combining chili powder, salt, garlic and onion powders, black pepper, sugar, dry mustard, and bay leaf. Season the raw brisket on both sides with the rub. Cover the roast with the diced onions. Place in a roasting pan and roast, uncovered, for 1 hour. Add beef stock and Worcestershire sauce and enough water to yield about 1/2 inch of liquid in the roasting pan. Lower oven to 300 degrees F, cover pan tightly and continue cooking for 3 hours, or until fork-tender. Slice meat thinly across the grain. Top with juice from the pan.